Does This Footer Make Me Look Fat? Is bigger better? Certainly not when it comes to the most common New Year’s resolutions (and kudos to those who are still on track). However, when it comes to your website footer, you want something that’s informational, can help your company achieve its goals and is, surprisingly, much larger than you think. What’s a footer? And why do we care now? If you follow the traditional rules of website design, the common notion is that the most important information must lie “above the fold”—before you start scrolling. Your website footer is located at the bottom of a web page and repeats some elements of the header in addition to fine print and copyright notices. Because it is often positioned so far below the fold, this implies that the website footer isn’t as important as the header or body of the webpage. As such, it has not been given the attention it deserves. More and more, the website footer is becoming just as important as—if not equal to—other parts of the webpage. Recently, there has been a trend towards “fat footers," or website footers with more information than traditionally recommended. These footers are filled with content, sometimes even a mega menu that includes all the links and content you would find in the header dropdown navigation menu. What’s causing the fat footer demand? So why is the big website footer suddenly so important? Mobile may be to blame. One finding shows that it’s now normal for users to scroll directly to the bottom of the website on their mobile devices. The mobile vertical swipe functionality makes it exceptionally easier to reach the bottom of the webpage on mobile compared to desktop. It also encourages visitors to explore, click and scroll even further down the page than before. This is also in line with a study by Chartbeat revealing that visitors spend more time than you’d expect scrolling down the average website. 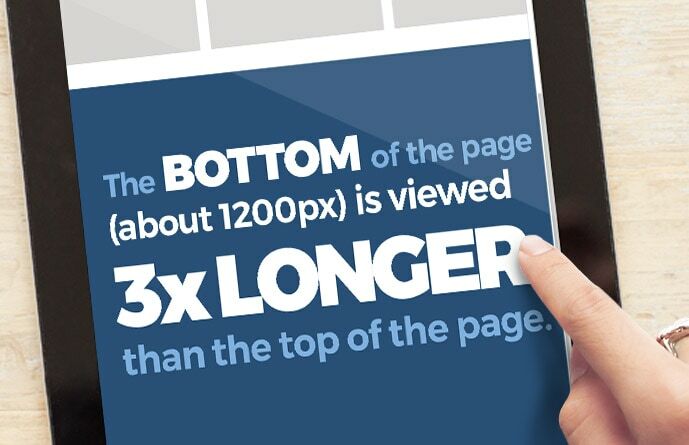 The most-viewed area of the page is just above the fold (at around 550px), but the readers who scroll down the page actually spend more time and engage with the website more at the bottom than they do at the top. This portion of the page (peaking at about 1200px) is viewed for nearly 3x longer than the top of the page. For most websites, this is a prime position for an informative and functional website footer. Mobile website traffic is surpassing traditional desktop browser traffic, giving the footer even more exposure to site visitors. Now more than ever it’s important to optimize this space to give viewers the content and navigation they’re looking for at the bottom of the page – and that means having an attractive and functioning footer. What should I put in my footer? Mirror your header – If you’re finding that your audience consists primarily of mobile users, then it might be a good idea to adapt your navigation functionality at both the top and bottom of the page. This can include an expanded sitemap and your social media icons. Provide additional information – This can include anything not easily displayed in the header, such as an email newsletter signup or other transitional calls-to-action. Further reading material – Blog articles or external links can encourage further engagement and exploration. Contact information or a contact form – Good user experience suggests that contact information should be found in your footer, if not a full contact form that a user can fill out. A map link and clickable phone number are also useful for mobile users, but make sure to avoid email links as they are spam magnets. Use contrasting or reversing colors in your footer background and font – This is a visual clue for the viewer to know they’ve reached the bottom of your website. Should your website use a fat footer? Unfortunately, there's no simple answer to this. Every company has different needs and goals, so a fat footer isn’t going to work for every website. For example, an ecommerce site or a website that requires visitors to search through different types of content would benefit immensely from a footer stacked with links to additional pages and contact information. However, a smaller website with a singular goal, link or call-to-action may not want a large footer, as it may make the site look cluttered and be distracting from the overall goal. Whether you use a fat footer, a traditional smaller footer or anything in between, the most important thing is to make sure the user’s experience is engaging and straightforward so they can easily move throughout your website. A fat footer can provide a natural way for users to easily find the information they need to then make a purchase, submit a form, or whatever your goal for the website may be. Stay on top of your goals and think BIG with a simple website modification – just be sure to ask for help if you’re unsure. Talk to your marketing agency and discuss whether a fat footer is a right fit for your company's website.